Tinnitus refers to noises heard by the affected person that cannot be attributed to an outside acoustic source. The noises vary in volume and frequency as well as their localization, and can occur on one or both sides. There is much discussion about the possible causes: infections, for example caused by borrelia, gonococci, autoimmune processes, side effects of chronic or degenerative diseases, inner ear trauma (e.g. diving), or excessive noise exposure. For this reason, the first therapy approach is usually a diagnosis of the possible causes by a specialist or a systematic naturopathic diagnostic to treat the underlying disease early on. If systematic pathologies can be excluded, tinnitus is treated by osteopathy. This is an additional therapy concept, because osteopathy uses an anatomical approach whereby all structures involved in the process of the development of tinnitus are brought in balance with each other. 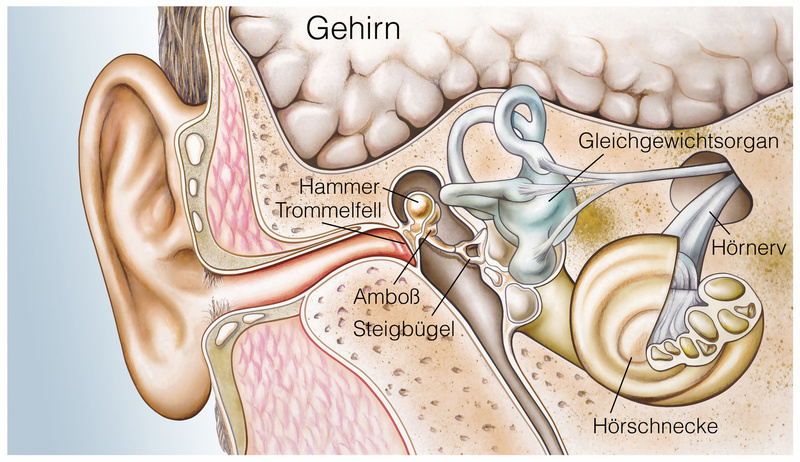 Tinnitus is predominantly about the structures of the head (cranium). Here, not only the bones should be free in their movements, but also the structures running through them, enclosed by them, or connecting them, like nerves, arteries, veins, and sutures. One structure that is important for the pathology of tinnitus in connection with this is the jaw. The jaw reacts to the tension of the organs’ fasciae, as well as to faulty crowns and bridges, and orthodontic interventions. Not only psychological stress, but also physical stress, for example caused by pain pathology, infection, intoxication, or through an overall deterioration of general health, can contribute to the development of tinnitus or lead to its worsening. The parietal system is also of special significance. Here, the structures of the cervical spine as well as the fasciae and muscles of the shoulder-neck area lead to tensions and blockages of the nerves and blood vessels. When we apply our knowledge of the principle of osteopathic compensation, the structure of the musculoskeletal system can moreover help us understand the causes for the development of tinnitus. Osteopathy is a holistic therapy, where the cranial, parietal, as well as the visceral systems are examined and treated in every session, because any restriction of these also influences very distant structures. Unfortunately, treating tinnitus is often difficult and patients can experience severe psychological strain. It could possibly be a pathology that is triggered by stress and which in turn also causes stress. The sooner osteopathic treatment is started, the higher the chances that tinnitus is treated successfully by osteopathic therapy. For acute occurrences of tinnitus, treatment by an osteopath can be carried out at the same time as medical or additional naturopathic interventions. If you have any questions about tinnitus and therapy options with osteopathy, please contact us.